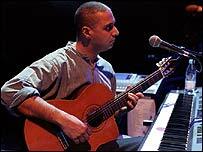 DJ, musician and composer Nitin Sawhney is to unveil his latest classical work in London next month. The artist has been commissioned by the Britten Sinfonia to write The Classroom, which is about "expanding the imagination and exploring ideas". It will get its UK premiere alongside orchestral arrangements of his past works in London on 17 November. It follows his first work for the Britten Sinfonia, Neural Circuits, mixing music with 9/11 news reports. Sawhney has been acclaimed for his innovation and versatility, with abilities that range from being a dance DJ to playing flamenco guitar and classical piano. He has written scores for more than 25 films, has been nominated for the Mercury Music Prize and won a Mobo award. He was even part of the comedy act that created Goodness Gracious Me, starring in the radio version but dropping out before it transferred to TV. His new work will be performed at London's Royal Festival Hall before going on tour to Brighton, Cambridge and Birmingham.